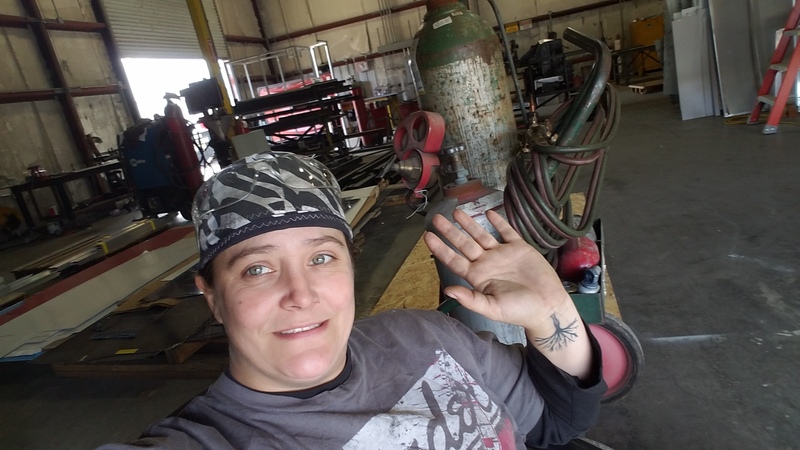 Sheranda, 37, from Magnolia, TX, graduated from the Welding Specialist program at Tulsa Welding School, Houston campus in January 2017. After years working as a cook, Sheranda wanted a new career. Thanks for speaking with us Sheranda. What made you choose welding? I chose welding because I’m still creating things with my hands. I can leave my signature on everything I do. I get to say “this is something that I did from the ground up”. With what I’m doing now in fabrication, I see the product through from beginning to end, and I get to be a part of every aspect of that…it’s just so satisfying to be able to be a part of that. Working with your hands, creating things, working with heat – both cooking and welding!? Ha ha! I guess there are some similarities, yes. Cooking and welding are both art forms in my mind. Why did it take you till your mid 30s to become a welder? Really it’s because I was ready to settle down and have a family. I got married about a year and a half ago and becoming a welder was a financial decision. I wanted a career, not a job; a career where I could have benefits and earn more money to help my family grow. The culinary world doesn’t really offer that. How did welding first catch your interest? My uncle was involved in welding. He graduated from a two year welding college in the late 1970s. My father always told me that welding was a good career to get into, and it always sparked my interest. You basically have lava at the end of your fingertips that you’re guiding where it needs to be, and you’re molding metal together. I mean how much more exciting can that be? My favorite part was being able to learn side by side with my peers as we all grew together. You get pieces of information from everybody because we’re all learning at the same time. Our instructors would show us and help of course. Everybody welds a little bit different that the person next to them. That was one of the reasons we get different instructors throughout the program because we’d be able to learn different methods of welding. You can pick up a little something from everyone to build your own style of how you weld. That was very interesting to me. How many other women were there at school? When I started I was one of maybe a dozen women that were enrolled, but by the time I left there were probably a couple of hundred women at school. They say that women make very good welders because we have the patience! Did you leave TWS feeling like you were on your way to becoming a specialist? I’d never welded a day in my life before I set foot in Tulsa Welding School. I was as green as they come. But when I left, I did feel that way. I was confident when I left. When I got the interview call I was ready to take their welding test…and I passed it! So tell us how you got your job. I was two weeks from graduation. I’d finished my course completely, and I had no more testing to do. The school had us work with a counselor to help us build our résumés, which was wonderful by the way. She printed it out, and it looked very professional. In fact I have to give my counselor a lot of credit for the job that I got because my résumé was so beautiful. So I got on the computers at school and started looking up jobs. I really wanted to stay closer to home as we’re fixing to start a family and get a new house but traveling would have been an option if it came to it. So I was looking all around Houston, Baytown, I was looking at the oil fields, a little out of state. I probably put 200 résumés out there. I was also doing some driving, pounding the pavement, putting paper résumés out going and talking to people. I probably called on a dozen shops here locally. Then within a week or so, I got a call back from Turnkey Industries. They design and manufacture custom truck bodies, trailers, and containers. They set me up with an interview and a weld test. I started work there three days before graduation! They even let me have half of that Friday off so I could go to my graduation. It was so nice of them to let me do that because it was kind of a big deal for me. We weld frames for trailers and all kinds of stuff. I mean it’s fabrication, so we could be welding from ground level on a trailer all the way to a support beam for a wall, or a plate for an air conditioner or TV unit. It’s mostly aluminum MIG; we do some carbon steel, not much stainless at all. We have five shops at our location, and I’ve worked in every one of them. They like to make sure their employees get to see every aspect of the process. I like that because I’m learning a lot. I’ve learned more than I could every have imagined at this place after graduating from welding school. It’s been really good, and it’s only been about three months! It’s been a great ride so far! It sounds like it! It’s not even been a year since you enrolled at TWS in summer 2016! It’s been a great year so far! I graduated two days before my birthday in January. Going to welding school was the best decision I could have ever made in my life. It’s changed my life around. We’re fixing to rent our first nice, nice home in a great neighborhood in Tomball, TX. We’re actually waiting on a call from the realtor tonight! My wife, Stephanie, is a teacher in Tomball, so she’ll have no commute and it’s only about 15 minutes from my job location. We’ve also bought a new car. I mean things are definitely on the up for my family, and it’s all thanks to welding and taking that step in my life. We have reached all the short-term goals we set when I stepped into Tulsa Welding School, and now we’re reaching for our long-term goals! I like that when my hood is down, everything else disappears! It’s just me and the tip of that stick or the end of my nozzle. I’m so very focused on what I’m doing. It’s just me and what’s going on in that moment and everything else just kind of shuts off for a while. It’s almost Zen-like! Welding meditation! We celebrated. We had a fancy dinner. I think I even went to Dallas and saw my sister. Now we’re getting caught up on bills, and we’re ready to move in to this nicer house. We’re moving on to the next level in our lives, we’re ready to have a family. I just stepped out of school so I’m still learning a lot. A lot of places want two years experience before they even give you a welding machine to weld with, often you’ll start out as a welder helper. I got lucky. I stepped into this, and they hired me as a welder even though I do things other than welding too. So in two or three years I’d hope to become a shop manager here, or maybe I can branch out and see what the world will offer me when I have a few years’ experience. A lot of places want you to have two to five years experience before you make the big, big bucks. I would really love to weld on skyscrapers, set, and weld the beams before they put the walls in. I would like to go high…like those old Manhattan black and white photos. I have no fear of heights! I would love to but I don’t have a welding machine yet. I do have a friend who lets me borrow his occasionally. It’s just a small welding rig. I did a lot of practicing at home with it. I do have a welding bench that I’m going to set up in the garage of the new house. Hopefully, I can run into a nice little rig that’s reasonably priced to start me out. I’d like to be able to do some around the house jobs, or welding a BBQ pit that a friend needs – that kind of stuff. Did you make any lasting connections at welding school? I have a few friends that graduated with me that I still keep in touch with. Some of them are welding in downtown Houston doing some stuff that I’d like to do, so it’s good to keep in contact. I’ve also had a few students that I graduated with apply at Turnkey. I reached out and told them that we were hiring, and they got hired on, so I’ve got a couple of Tulsa guys that are working with me. I’d tell them to stick with it, pay attention, and ask questions. All the instructors are willing to help. They’ll even step in the booth with you. I even had one who put his arms around me and showed me how to do something. A lot of the instructors are retired welders; they weren’t teachers. They just came across this opportunity and wanted to help the next generation of welders learn. So pay attention, and put in the extra time. Be the first one there. Be the last one to leave. Do everything they tell you to do, and do it how they show you to do it, and you will succeed. Don’t give up. There were times I’d come home and cry. I know there’s no crying in welding! But I’d cry, “I don’t know if I can do this!” But the next morning I’d get up, get my gear together, go in there and just try every day. It’s all about time under the hood. The more you do it, the better you’ll be at it. A good support system helps too – for encouragement. Stephanie was my rock! Right now we have some acres so we enjoy bonfires in the evenings. We also enjoy going to the movies. We like to eat. We’re foodies obviously as I was a cook for 12 years, so we like to have nice meals. And my dogs; I love, love, love my dogs! That’s my retirement plan. I’d like to have a kennel and rescue dogs. I would probably put my wife on a jet plane with me, and we’d fly to Ireland and have a nice lunch! Then we’d come home and take my dogs to the fanciest dog salon! That’s probably what we’d do!